Most religions in this world have made efforts and taken interest in the creation of peace and happiness needed by us all. 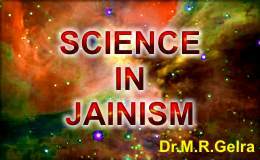 Jainism, however, affords a wonderful insight not only to its religion, philosophy and conduct but also to the Jain science presenting the mind of scientific genius of Jain scholars. The Jain contribution to science seems to have leaped beyond Einstein's theory of relativity, beyond Plank's quantum mechanics and beyond big-bang theory in respect of the knowledge of very small and very large of the universe. It is interesting to find the concepts and properties and existence of various forms of Pudgal (matter), which are finer than atom, electron, gluon, photon, and graviton and larger than the size of big stars and Milky Way. Jain scriptures have provided a classical knowledge not only of life and consciousness but also of the external world. The description of the cosmos, dimension of space, transition of soul during transmigration, existence of black holes, form, structure and dynamics of matter (Pudgala) are available in the scriptures. The elaborate description of the medium of motion, medium of rest, concept of space and time, and special reference of directions has put Jainism on a sound scientific footing. The Jain science developed specially to explain the material nature of karma because the soul cannot be liberated until the nature of karma is known. It was certainly true in the past that what we call intelligence and scientific discovery give a survival advantage but it is not so clear now as the scientific discoveries may well lead us to complete destruction of the human kind. The modern age has become meeting point of Religion and Science. It is true that in the material, mechanical and the electromagnetic universe, there is as yet no true transition to the fourth dimension of religion but it is a favourable sign that there is a shift in the thinking of the modern theoretical physicists from purely physical problems to the question of consciousness and morality. It reminds us of a great physicist of our time the lucasian Professor, S. Hawking who writes that the universe may be finite and with no boundaries, no edge in space, no beginning or end in time and therefore nothing for a creator to do. While reading the views of S. Hawking one feels that a Jain Master is giving his views on the universe. It is true that out of all ancient Eastern Religions, it is only Jainism which believed that the universe is eternal, working by its inherent laws and not created by any God or Supreme Being. According to the Jain philosophy, it is matter and soul, the two realities which are responsible for the existence of the universe. The time has come when religions should review and re-examine their theories in the light of modern science to revitalize themselves. On the other hand, a certain ethics and cultural atmosphere is essential to the proper functioning of science, for science has its own institutional and cultural preconditions. It will be proper if religions develop a proper image of science in its social and cultural contexts. Jainism may provide a critical perspective and a three-fold relevance for the present day scientific thought.